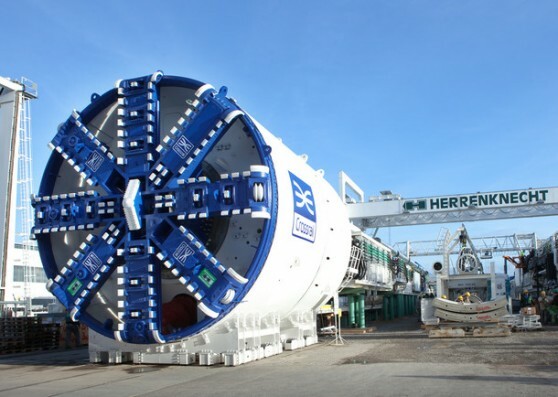 This week the first of eight massive 140m long, 1,000 tonne tunnel boring machines for the Crossrail project in London was unveiled (see picture). At a cost of €19 billion, Crossrail in London is the largest construction project in Europe. The financing of the railway line, which will cut across London from East to West, has been the biggest barrier to its construction – the route was first suggested in 1943. The first trains are planned to run in 2017. But even today, the UK government continues to disagree with stakeholders about the finance for the project, most recently with the multi-billion Euro contract to build the trains. Crossrail is funded by a combination of private and public money, with private sector contributions from The British Airports Authority (BAA), the City of London and Canary Wharf in the range of hundreds of millions of pounds. The public sector money comes from London’s regional transport authority, Transport for London and the central government office, the Department for Transport. Around €1.2 billion of Transport for London’s share is being loaned to it by the European Investment Bank. However, public sector money ultimately comes from one source – the taxpayer and transport user. This causes the most disagreement from locals in London, who are facing large bus and tube fare increases for years to come. Nonetheless, the benefits of large transport infrastructure projects speak for themselves during times of recession. Crossrail will employ 14,000 people directly and 7,000 in the supply chain during its construction. According to Crossrail, in monetary terms the benefits to the UK will be €50 billion. Not a bad return on investment and the boring machines will have some good resale value second-hand.